Congratulations to the International Credit Union Movement on achieving a significant milestone of three scores and ten, your 70th anniversary of International Credit Union (ICU) Day. Synonymous with the celebration of 70th anniversaries, is PLATINUM. This year’s International Credit Union (ICU) Day® theme “Find Your Platinum Lining” is appropriately coined. According to Wikipedia, “Platinum is one of the least reactive metals, has remarkable resistance to corrosion at high temperatures, and is therefore considered a noble metal”. Indicative in that statement as it relates to the Credit Union movement, is their longevity in the marketplace for the last one hundred and sixty six  years, resilience to be adaptive to the dynamic and ever changing financial environment, and ability to impact the lives of individuals in all sphere of life, by administering a noble service by “people helping people”. Credit Unions throughout every conceivable location within the globe continue to perform a noble service by providing products and services to their membership, positively impacting the quality of their lives. We at MSD are elated to be a part of this enabling process and authentic difference by providing quality technological solutions to Credit Unions throughout Trinidad & Tobago and the wider Caribbean region to enhance the perpetuation of this noble service, while ensuring Information Technology [IT] continues to be fused with traditional customer service, so as to maintain a customer centric approach when services are delivered to their membership. In recognition of Credit Union Month, October 2018, the management and staff at MSD extend to all our loyal and dedicated Credit Union customers in Trinidad, Tobago and throughout the length and breadth of the Caribbean islands and by extension the world, an eventful, productive Credit Union Week [October 15-19], and a blessed and reflective International Credit Union Day, Thursday October 18th 2018. 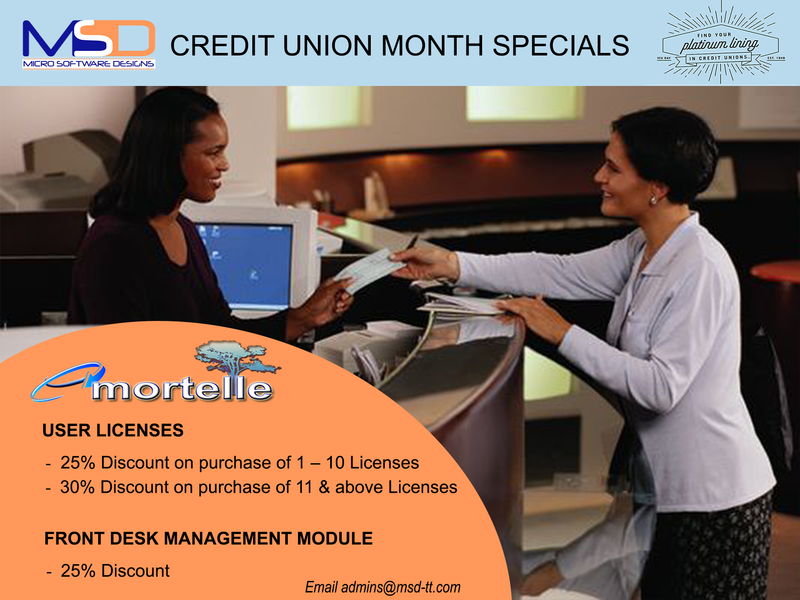 To mark this momentous occasion MSD will be offering specials on our flagship product Emortelle V 9.1. For further details please click here.